One of the critical factors for an effective install is a well-prepared and well-designed graphic, especially when it comes to tiled large graphics. Tiling for large wall graphics requires more preparation and planning. When starting the job, it is important that the graphic designer has accurate dimensions of the wall. The designer must allow at least half an inch bleed all around the graphic. For wall graphics taller than 60 inches, horizontal or column tiling is preferred—where the overlaps will be on the left and right edges of the print. The type of material determines the amount of overlap. For cast films, at least 1/8″ to 1/4″ inch overlap will be sufficient. Depending on the type of calendered films, the overlap can be at least 1/4″ to 1/2″ inch. Remember, tiling must be done by the RIP software – such as Versaworks or ONYX – and NOT in design software like Illustrator or Photoshop. Using the RIP software for tiling eases the design process. This ensures that the overlaps will be properly placed and there will be no need for a separate file per tile. Before printing, determine which width of media will be best to minimize waste in the overlap areas when tiling the graphic. Print a downscaled mockup of the graphic on a piece of paper. Label the tiling sequence and include the actual dimensions and distance between seam lines. Tiling for large wall graphics is easier with a detailed mockup. 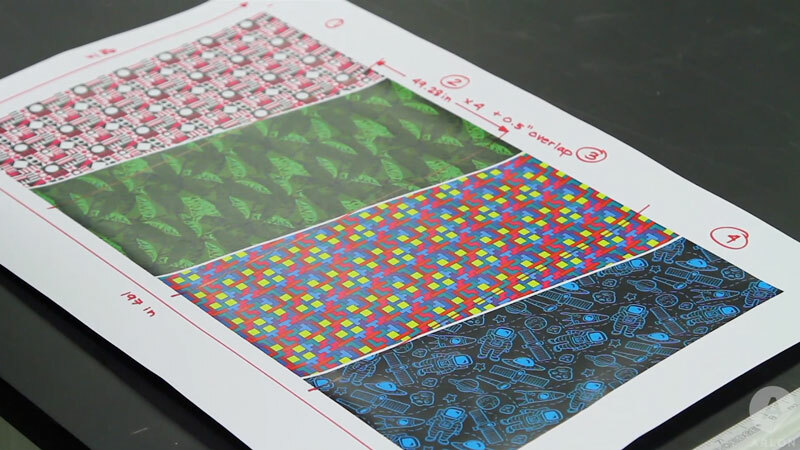 After printing, drying, and laminating, separate each tile. Take note that you will be installing the bottom-most tile first in the overlapping sequence. Cut the white, unprinted edges off the overlapping tiles. Carefully align the overlaps of the two adjacent tiles. Apply small strips of blue masking tape across the seam every 2 feet down the graphic. In order to prevent cutting on the real graphic, use a small piece of release liner under the blue masking tape. Cut the masking tape along the edge of the overlaying tile. This will serve as registration marks for installation. Repeat this process on all panels. Then, using a release liner knife, cut a 2-inch strip in the liner approximately 6 inches away from the top edge on each tile. Leave this liner strip in place. 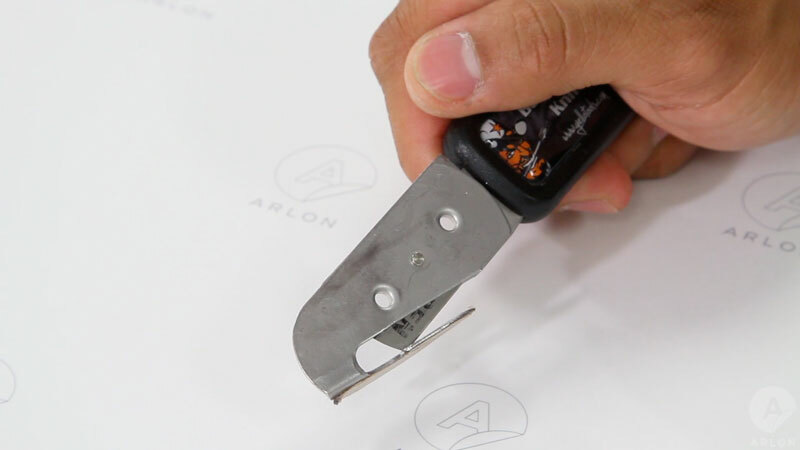 Use this release liner knife to install your finished graphics. Next, label each tile accordingly with the mockup print and roll them up on a core in reverse sequence. You are now ready to ship the graphic to the job site. In conclusion, by considering the desired results and the actual application process, you can eliminate frustration, wasted time and effort, and costly mistakes. Now you are an expert in tiling for large wall graphics… But do you know how to clean a finished wall graphic? Learn about cleaning large wall graphics right here at WrapItRight. Louie started working with Arlon Graphics’ Technical Services in 2013. By being part of a team whose goal is to bridge end-user’s demands to R&D and QA, he was able to gain both external and internal insights on how graphic films are designed, made, used and improved. His automotive background also allowed him to contribute ideas regarding technologies in the automotive industry that may affect a product’s design.